Ellis is 16 lbs. and 10 oz. and in size three diapers! Each month sees his personality more and more set. He's our little observer; he's not going to rush into anything and he's so serious. He's set on taking everything in and making sense of it. Because of that, he seems to put how things work together quickly; he seems to get cause and effect! One funny example is, he has realized it is himself in the mirror. He also likes to be facing forward as we walk, so he can see what we're walking into. He also went through a bit of a shy period this month. Strangers make him wary, even such "strangers" as grandparents who went on a trip for a week. In those cases, he likes to make sure Mom is in sight! He can also get bashful very easily. Daddy can draw out laughs like nothing else, but when it gets overwhelming, he'll turn and bury his head in my shoulder. I tease him that serious boys need silly parents. He does like to laugh though. He makes you work for it, but when he grins, whoo-boy! Stand back. That grin threatens to spill over the edges of his face, it's so wide. Mommy and Daddy are still the best playthings; generally speaking, he still doesn't care about toys all that much. Except- for his teddy bear. He lights up even just seeing this thing. I have the bear talk to him in a funny voice and give him kisses. We play the song "Teddy Bear's Picnic" and dance around. This baby and bear- it's a lifelong friendship and it cracks me up because, while we had been trying to get him interested in a lovey as per some sleep advice, this wasn't the lovey we'd been pushing. Love at first sight, that's what it was. He also likes to read; he likes to turn the book pages and I've noticed he even has preferences on what are his favorite books (I Kissed the Baby, The Hungry Caterpillar, and Goodnight Moon). His other great love- or loves, as it were- are puppies. (Well, any dog. He's not picky about age, but baby-talk. They all get called puppies.) He watches our two with keen interest, no matter where they are in the room. His tracking abilities are so much improved to be able to do this! His grandparents' dogs are equally interesting to (and interested in) him. My dad thinks it's because they are close to his size. Yesterday, he went to play fetch with our fox terrier Stella. He was laughing at all her antics, so I think a new daily ritual might have been born. This probably isn't that interesting to anyone else, but, as all parents discover, everything from their temperament to your sanity is dictated by a baby's sleep. So. Prepare for some number crunching. 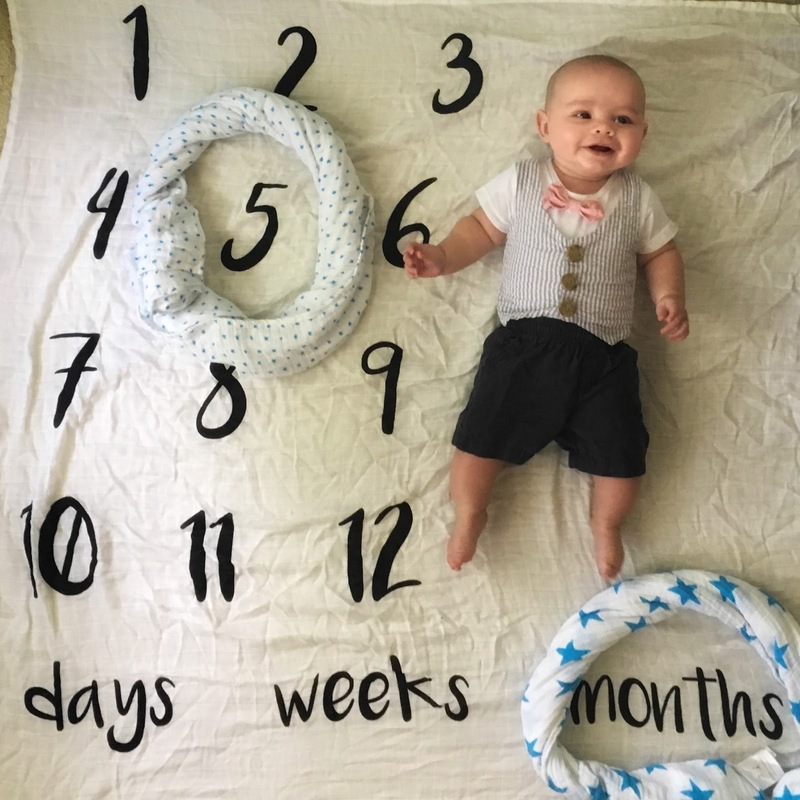 Between being sick with an earache and several (very fun) visitors, any semblance of a nap schedule was in shambles at the start of his 5th month. So, with school out for summer and me home for several months, my focus was on getting sleep back on schedule. I can't recommend the book Healthy Sleeping Habits, Happy Child enough. It is a little heavy on the academic research, which is fascinating but can be hard to plow through when you are tired and desperate for solutions. But it is all good advice. We've developed a more through bedtime routine and moved that bedtime forward, based on the book's advice, which works well. Because he goes to sleep so much earlier, there is still typically one "dream feed" before I go to bed and one (or two if we are unlucky) wakings at night. We've had a few nights here or there of sleeping through the night; if your babe was sleeping through the night let us know what your secret was! Naps have gotten better too, with a nap in the morning, and a nap in the early afternoon and- sometimes- a nap in the late afternoon (those are followed up by a later bedtime too). The darling thing is, he is such a calm morning baby. He will wait quite patiently in his nursery till we are up and he gives the biggest grin when you walk in! Still all formula, all the time, though we've been given the go-ahead that he can start on foods anytime we think he needs more sustenance daily, for when just milk wasn't cutting it. That said, they did recommend waiting as long as possible to avoid food allergies. Well, food before one is just for fun. 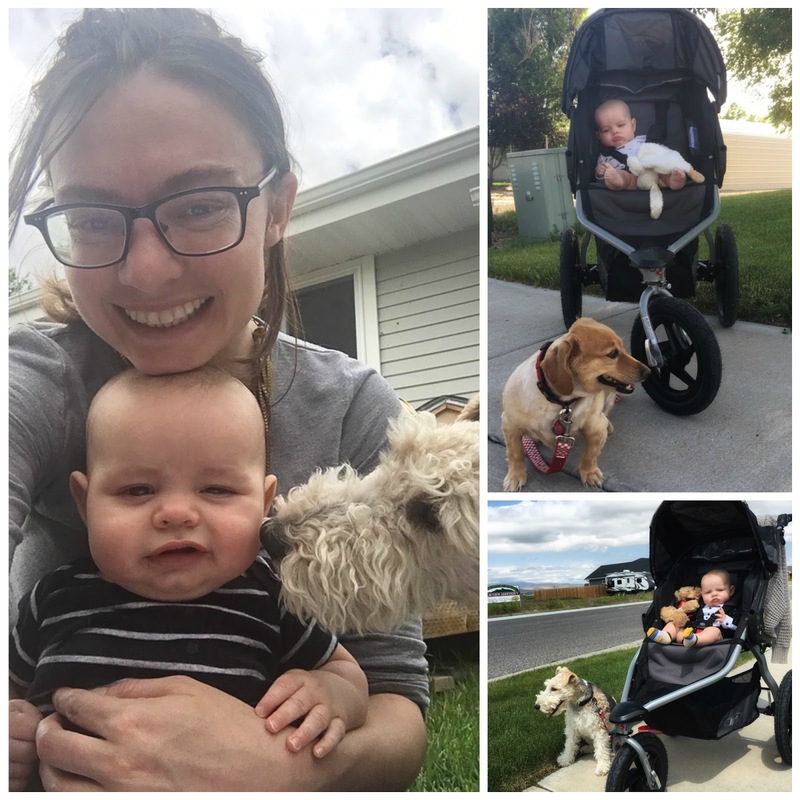 Summertime finds me a Stay-at-Home Mama. Whether this will be the case come fall is still up in the air. One interesting shift this has created is seeing how absence really does make the heart grow fonder. Ellis loves seeing Daddy and will instantly light up at the sound of his voice. Mommy he can see and play with any ol' time; Daddy-time is rarer and therefore more fun. It would bother me a bit, but they are so adorable together, and Amos is the really the best dad and the best partner I could ask for.